South Korea has very few natural resources. The country isn’t stocked with oil, much natural gas, or even many minerals. What it does have is an enormous quantity of sheet masks, BB creams, essences, and face masks packaged to look like tomatoes. These beauty products are on the verge of becoming — in addition to electronics and cars — one of Korea’s biggest exports. And they’re getting there with help from an entity you might not think would trouble itself with banana-shaped lip glosses or lace sheet masks: the Korean government. “Korea is always looking for new products to export, and right now, one of those is beauty,” says Charlotte Cho, the founder of Soko Glam, a U.S.-based online shop for Korean beauty products. The GDP growth strategy seems to be working. Last year, for the first time, Korea exported more beauty products ($1.067 billion, according to the Korean Pharmaceutical Traders Association) than it imported ($978 million). So far, in the first half of 2015, according to the Korea Customs Service, the total export value of Korean beauty products to the U.S. was $52 million, a 60 percent increase from last year. 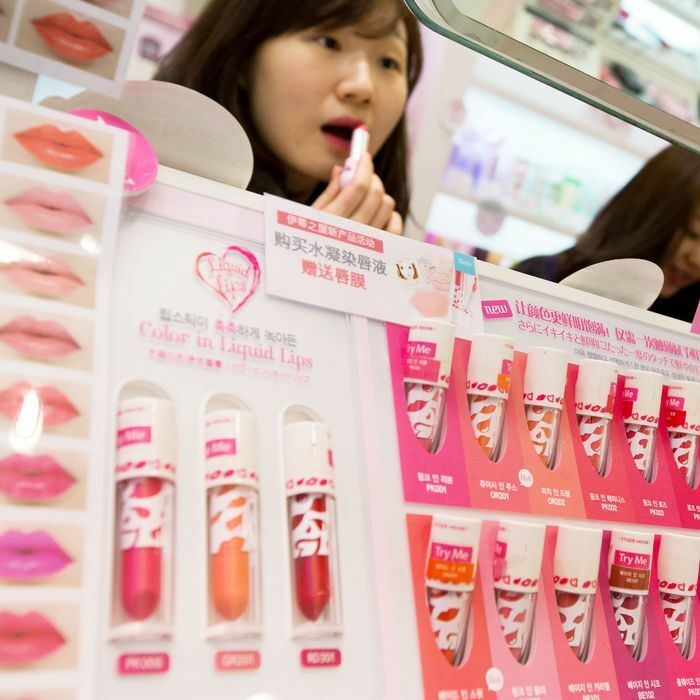 America is the third biggest export market for Korean cosmetics companies, after China and Hong Kong. The idea of a foreign government invading our vanities is amusing, but it’s also going to have a very real impact on American beauty culture. “In the past, France was considered the global leader in beauty, but now all eyes are on Korea,” says skin-care expert Peter Thomas Roth, who founded his own namesake skin-care brand 22 years ago. Korean products, especially skin care, are seen as the most high-tech out there by pretty much every cosmetics expert — Lancôme even credited the country’s advancements in featherweight foundation when it launched its own Miracle Cushion foundation. And the country is equally innovative when it comes to business: Tony Moly, a popular brand, brings products from development to production in only six weeks, making it something like Zara. The more money the Korean government invests in beauty technology, the more American beauty is going to shift. Right now, there are about 1,800 to 2,000 beauty brands in South Korea, a huge number for a country so small that it would fit in the area between Los Angeles and San Francisco. “It’s a staggering number,” says Alicia Yoon, a Harvard Business School grad and the co-founder and CEO of Peach & Lily, a website that’s the exclusive retailer for many Korean brands in the U.S. Many Korean beauty companies started to look outside the country, first to China and Hong Kong and, increasingly, the U.S. — and the government stepped in to help. It has a close relationship with the Korean International Trade Association (KITA), a nonprofit group that helps small-to-medium-size Korean companies break into the U.S. market by introducing them to American retailers and distributors. It also coaches them on pricing, the amount of stock they need to have to sell in the U.S., and how to package their products to appeal to buyers here. The more well-known Korean-government-supported exports, like Samsung, LG, and Hyundai-Kia, were built up after World War II. But in the 1990s, the Korean economy plunged into financial turmoil caused by banks loaning too much money to these huge companies. The IMF approved a $57 billion bailout package for South Korea, the largest in history, and the government had to rebuild and diversify the economy. One of the ways they did this was by encouraging — and exporting — Korean media and entertainment. The result is that you either delight in or roll your eyes at a Korean Pop (K-Pop) singer, like Psy (and his single “Gangnam Style”), or band, such as Exo or Super Junior. Or you might have seen a Korean television drama (K-Drama), like “My Love From Another Star.” This is called hallyu or “the Korean Wave” (i.e. Korean culture crashing over the rest of the world), and it’s given the country a much bigger stage from which to sell its stuff. “Think of Korea as the East Asian Hollywood,” says Angela Kim of Korean beauty e-commerce and networking site insiderbeauty.com. In Korea, the government gives tax breaks to export-only companies, like Wishtrend, a four-year-old Korean beauty company that sells only to the U.S. — it doesn’t have to pay taxes in the country at all. “If we had business in Korea, we’d pay 10 percent in taxes, but they refund our 10 percent,” says Eddie Aram Baek, Wishtrend’s chief marketing officer. The company says it’s doubled its sales every year since it was founded, and in 2014, sold about 200,000 products to the U.S.
Conversely, there is also a government fund set up to pay the legal fees for companies who may need to sue to protect their brands overseas if, for example, they find someone is importing them illegally (called a gray market). “When the Korean government gets behind an industry they will come up with all sorts of funds to help this expansion,” says Peach & Lily’s Yoon. The government is even supporting spas as tourist destinations. Skin Anniversary’s Nuganic brand has a warehouse with 600 beds in rows where, with the help of the government’s tourist organization, busloads of usually Chinese sightseers get dropped off for a facial and sent away with a goody bag of the brand’s gentle products — and hopefully a desire to see the rest of what the Korean beauty industry has to offer. Of course, as with many government efforts, sometimes the good stuff gets buried under bureaucracy and dry language. In 2013, the Korea Health Industry Development Institute (KHIDI), which works with the Korean Ministry of Health and Welfare to help the Korean health-care industry expand overseas, opened a pop-up store in Soho called “Korea Cosmetic Bliss” (it closed in May 2014). “America is wondering and waiting for the next big Korean wave following Gangnam style,” read the introduction to the shop on its website. “Thus, the Ministry of Health and Welfare of Korea and Korea Health Industry Development Institute have prepared a flagship store in Manhattan, the center of cutting-edge fashion and beauty.” It was the kind of ad copy Jeb Bush might have written for L’Oréal.